Once upon a time, there was a lady who loved writing. She used to write and share her ideas, recipes, craft projects, book reviews, and other things with the world. Then she went and had a little boy, then another little boy, then a little girl and she stopped having time and mental energy to write. She traded her writing for cleaning car seat covers when they’ve been... soiled, looking for recipes to make dinner in 30 minutes or less, doing loads and loads (and loads) of laundry, searching for the best parks (which, in her opinion are those with NO sand, no bark, no swings, with shade and a big fence). Yet, she digresses. I think you should write again. Why, she asked. What would she write about, she pondered. And then it came to her. Maybe other people would find value of she shared all the things she’s discovered in the 4.65 years since having her first son... Things like: how to go grocery shopping at Trader Joe’s with the world’s tiniest carts and three children (Hint: a hand basket fits perfectly underneath the cart), and many others. So, she relunctanly said to the Hubster, you are right. She is an Enneagram Type 3 (she’d have you know) which makes it incredibly difficult to admit someone else is right. Yet, she paired her bluetooth keyboard, sharpened her Palomino Blackwing Pearl pencils, and began to write. It feels really nice to be back. What part of you has become dormant while you have been busy doing other things? It's time for me to hop back in the saddle, again. Will you come with me? One day, not so long ago, a woman started reading books. These books were all about adventures: backpacking in the Utah desert, hiking Mount Everest, diamond heists. They also included books about famous people learning to cook, or learning how to love by doing. As she read these books, she discovered a theme that connected all of them: these people dared to be brave, and had courage to actually do something. The woman wanted her life to be worthy of writing a book that people would want to read. Maybe her adventure wouldn’t be an outdoor one, but it would be about daring to walk through new adventures in life. When the woman was finally given an opportunity to be brave, she took it. She didn’t push the opportunity away. She had never moved more than 20 miles, so when she thought about moving 3,000 miles it was huge. And that's how this woman moved 3,000 miles from Sacramento, California to Raleigh, North Carolina 3 years ago this week. She wanted a life of bravery and courage. When I read books like these, it helped me see I could have an adventure story too. I didn't think the books you read can make a difference in how you live your life. But I was never so wrong. Reading different types of books truly expanded my outlook. I thought I was just reading other people's stories. Little did I know that they had the ability to shape my thinking. That another person's story really could make a difference to me. A life lived that isn't always easy, where things didn't go as you planned, where hard things happened and the person kept going showed me I could be brave too. The beliefs we have about life can change over time. I've always heard sayings like, "readers make leaders" "what you read will be what you become". Little did I know these were accurate. So the next time you start reading a book, be warned it could change your life! I've been a parent for 859 days. Which makes me qualified to say I don't know what I'm doing! Nearly half of that time I've been a mom to two boys (if you did the math you'll discover our boys are less than a 15 months apart). I have my hands full, as I'm told nearly every time I walk into a store. A double-stroller is a must whenever I go out of the house. That, or a leash backpack. A backpack with a leash was a gift from my sister Heidi for our oldest son Sammy's 1st birthday. I think she knew I would need it in the days to come and she was right! Sammy is very adventurous and will always run to see the next adventure. I have found if you have a backpack with a leash attached to your child, you will get a range of looks and expressions. Many people will just look at you as if to say, "wow, you are walking your child like you would a dog. You must not have your act together." Others, my personal favorite, give you a look that says, "I know why you're doing that and you have my support." The best is when they sometimes remark, "I loved using that with my kids. What a great idea!" The leash backpack has taught me that I need to be ok with what I'm doing even if others seemingly don't approve of it. This has truly been a life lesson for me since I've often felt I'm going upstream in the things I chose to do (or not do). This situation has encouraged me to care more about Sammy's safety rather than getting the approval of others. At first, Sammy would fight us and not want to wear the backpack. It would be easier to not make him wear the backpack, but it is ultimately the safest for him. We started to pack it with some snacks, toys and his water bottle. Once he discovered it was full of things just for him, he liked the backpack. I think it helps that his daddy wears a backpack too! Something as simple as using a leash backpack, helped me learn I am parenting my children for the long run. I need to focus on what will help my son to grow up (safely) and what will give him the tools he needs to be a successful man. Often that means a little restraint, and learning limits. It's also helped me remember the greatest parenting tip I've ever received, "The only way to parent is from your knees". It's a scary thing to open your heart and life to other people. In order to have any type of meaningful relationships you have to expose yourself. For some reason, I've always jumped headfirst into friendships. Basically if you gave me the time of day, I thought you were my best friend. Almost becoming obsessed with you, I would gradually get to know you better and then realize we aren't kindred spirits I thought we were. Over the years and many friends later, I started to close myself off a little. Not wanting to invest unless it was safe. And, safe meant you wouldn't leave, or wouldn't hurt me. Shocker...life happens and friends move away, or the relationship drifts apart for whatever reason. It's in these waters that I found myself moving almost 3,000 miles from everything I ever knew. To a new city. The thrill of no one knowing me was almost intoxicating. I could reinvent myself. No one had to know anything I didn't tell them. I could be a new me; One that was funny, not so serious, or wasn't a burden. These are things people had told me in the past. So, here I was in a new city in a brand new stage of life: pregnant. About to enter the greatest unknown called motherhood. Friends are needed in times like this. I got a little brave. Everyone I was meeting seemed to have moved from somewhere else too. That's the funny thing about Raleigh. It's a city full of transplants. There are so few native Raleigh-ites (or North Carolinians) that it's surprising when you meet one. When we moved here nearly 3 years ago, a whole bunch of other people did too. We had this in common; we had left the familiar for an adventure into unchartered territory. So, I opened up. I had to. We had 5 things we needed: a healthy baby, jobs, a place to live, medical insurance, and a second car. These were serious needs. The one thing I didn't know I needed was humility. I got that when we moved here. I found out it's a SLAP to your pride to sit in a social services office and apply for food stamps. It's even more of a slap to apply and get those food vouchers. And then to need to use them. At a store. Where other people can see you. But, boy does it help you to gain a little compassion for others. It causes you (I mean me) to realize other people aren't just (fill in the blank), they might be down on their luck too. Trying as hard as they can. This is where a friend can come in and pick you up. I can't remember everything that was said to us during this time, but I do remember one friend who was always there; listening to me. She never judged. She didn't need to walk through the same experience I was going through in order to have compassion and not pass judgement on me. She graciously asked how I was and gave me that look of I really want to know and you're safe to tell me. Time went on and this friend became closer and closer. She was there with me as I was crying when I didn't have my family in town to help welcome our brand new baby. She sat on the bed saying I was brave and she didn't know how I was doing it. She would bring over the most delicious food cause it had the secret ingredient of love in it. It's been 3 years since I've known her and this week she moves back to the West Coast. There's part of me that doesn't want to open up to anyone again because maybe that person might move away too. But, there is no life in being closed off. I know that you can still be friends even if LOTS of miles separate you, and be grateful about how amazing it was to enjoy their physical presence. It is a gift to give someone your time and heart, and to have theirs too. Here's the thing though, when my friend gets on an airplane this week and says, "See you soon" I'll always have those feelings and memories to look back on and no amount of mileage can take that away. She gave me a gift of seeing me and accepting me that's making me feel brave to open up again. To not be worried how the relationship might go. To try and be vulnerable again. To keep investing in relationships even though I don't know where the road will take us. I'm so glad I was brave enough to share how I was really doing when she asked me. 2014 has come and gone. When a year ends I find myself reflective. This past year has been one of the craziest I've ever experienced. I learned how to trust the Lord's provision and sovereignty with hard times like never before. Join me as I summarize our year. 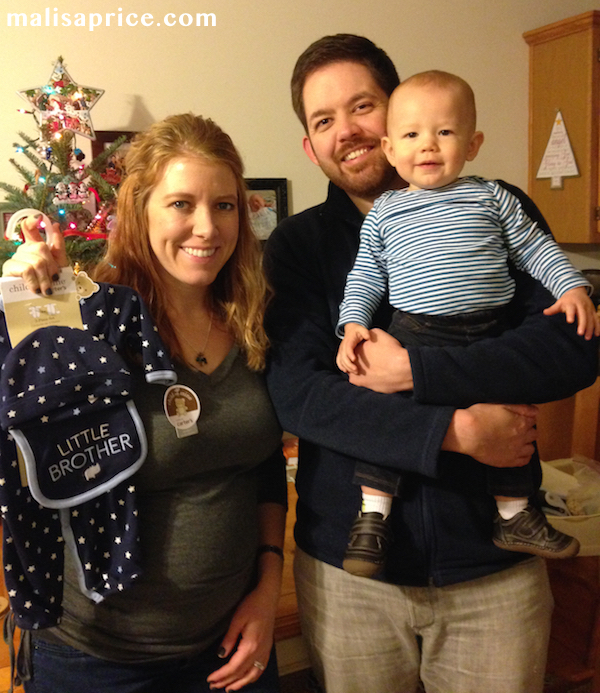 As the clock struck midnight and 2014 began, we found ourselves in the pediatric emergency room with our week-old little boy. Sammy had been breathing strangely and would just stop for what seemed like an eternity. Thankfully all of the tests and procedures said nothing was wrong. We were in the hospital over Christmas Eve and Christmas Day for his birth and both New Years Eve and Day for this little scare. This was not how I wanted the year to start. Over the next few weeks we welcomed and said goodbye to family visiting from the West Coast. All the while, Anthony was at a new job as a respiratory therapist 25 miles from our house. His position was scheduled to be nights and we were sharing one car. As his orientation ended, he began having anxiety that he (or I, for that matter) had never before experienced. We knew he needed this job. We needed healthcare. We needed an income. Even though he was working at a hospital, we paid over $600 a month for health insurance. We quickly realized we couldn't live on what he was making. Very soon anxiety, night shifts, distance and the car situation made us decide that he would resign on February 10th. There was no other job lined up. With a 2 month old baby, this couldn't be the best choice. Yet Anthony told me he had more peace about resigning than staying at that job. Having been unemployed or underemployed since moving to Raleigh, we had nearly depleted our savings. We sat in our front room and made the decision: if Anthony didn't get a new job by March 1st, we would pack up and move back to California on April 1st. On February 19th, Anthony had an interview with Citrix and the same day we got an envelope in the mail with $120 cash in it. We were encouraged that the Lord was continuing to provide for us. Less than one week later and before the March 1st deadline, Citrix called and offered Anthony a position to start work on March 17th. During the transition between jobs, Anthony made some money building websites and we received more unexpected money in the mail. We applied for WIC, a food program designed to help Women Infants and Children. As I sat in the waiting room, with my iPhone, Coach purse and nice clothes, I thought that everyone there had to be be judging me. We had purchased all of those things when we were DINKS (Dual Income, No Kids) and yet we needed government help to buy our food. This was one of the most humbling experiences of my life. I still don't know how we made it through those months without consistent paychecks, except for the provision of the Lord. I began to understand more of what the Bible says - if God takes care of even the birds of the air and the flowers of the field, how much more will he take care of his children? There wasn't a day we went without food, shelter, clothing, or diapers. In fact, we haven't gone into 1 cent of debt since moving to Raleigh. Although this humbling help from friends and family was first a difficult pill to swallow, I began to see it as the Lord's care for us. I did not like needing other people. I had been on the "giving end" for years, and this was truly a different experience. As time passed, I began to make our needs known. My mom and mother-in-law would ask what size clothes Sammy was wearing, what size diapers he needed and then a smiling, brown box would show up from Amazon! Friends gave us used clothes from their boys and now Sammy had a collection of toddler-sized clothing. He hadn't even turned a year old. Mother's Day was rapidly approaching and my mom was very sad that I wouldn't be in town so I called my dad and sisters and told them I wanted to surprise mom my flying to CA. My dad said he wanted to pay for the whole thing and booked the ticket immediately. It was great to see mom's face when Sam and I got out of the car at her house! We needed a baby gate, friends gave one they didn't need. Another friend thought Sam would like a ball and sippy cups and she bought them. These were small purchases and we probably could have managed them ourselves, but the point is, we felt like friends and family rallied around us and it was amazing to see. They wanted to give and be a part of God providing for us. All we had to do was accept the gifts. 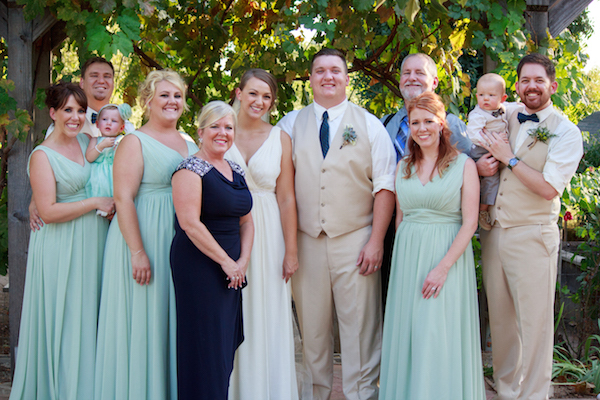 In the month of July, we were given almost $2,000 that paid for us to fly to California to be a part of my brother's wedding. We had a little extra for a rainy day and it is very rainy in Raleigh as we've learned! During the summer, Anthony's Dad called us and asked if we had a second car. He said he had an extra car and wanted to give it to us. Over the next couple months, he (and Anthony's grandma and aunt) paid the car off. In November, he drove it out to give it to us. You see, the car was actually a much bigger deal to us than just the value of a car. When we moved to Raleigh, there were 5 things we prayed for time and time again: a place to live, jobs, health insurance, a healthy baby, and a second car. By this time, 4 of the 5 things had been fulfilled. The car was number 5! Before we moved to Raleigh, we sold one of our cars and gave the money to friends. For many months, I was angry with what we had done, thinking we should have kept the car/money to help ourselves and here we were, receiving a MUCH nicer car and witnessing God's provision firsthand, yet again. I wish I could say I don't worry about money now, but I still do. I am getting better at trusting that God will take care of us. One way I can visibly see God's provision is through the generosity of others. As 2014 has ended, I am surprised at how much we have received - WAY over and above what we have ever given. Even today, we sit with a room full of beautiful toys, a table, food, candles, and shoes that others have given us. If we have benefited from your generosity over the last year, THANK YOU. It meant the world to us. We love donuts at our house. I mean, really, who doesn't? They are an indulgence that can put a smile on any age. Upon moving to Raleigh, I thought there would be a lot of old fashioned donut shops. Much to my surprise, I haven't found there to be many shops to choose from. We do have lots of Dunkin' Donuts and Krispy Kreme and a few speciality shops (such as Monuts Donuts in Durham). But the kind of donuts we like are the old-school kind. 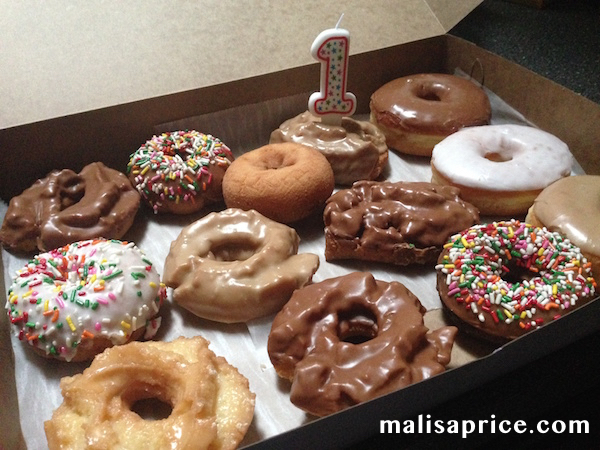 My personal favorite are chocolate old fashioned (the ones that look like saucers or have wings, as I call them). I found this post quite helpful to show/describe the types of donuts. 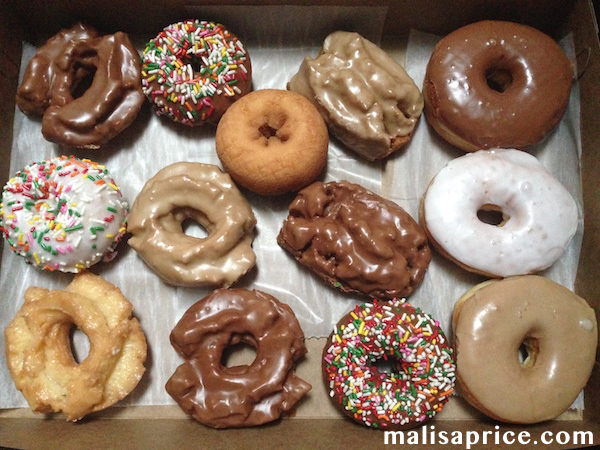 The point of this post is to let you know about the tastiest donut shop I've found in Raleigh/Cary area, Baker's Dozen Donuts. They actually give you a baker's dozen 13 donuts and the box we bought was only $8.50! They are open 7 days a week (6am-7pm). Baker's Dozen is a clean shop with lots of donuts choices, including apple fritters, and tables to enjoy your selection there. They are directly off of Buck Jones Road close to Cary Crossroads and REI. Since this past week was Sammy's first birthday, we celebrated with him by giving him his first donut. A white sprinkle donut that he absolutely loved. I hope you'll find this Public Service Announcement helpful for your donut consumption. From our family to yours, a very Merry Christmas and a happy 2015! 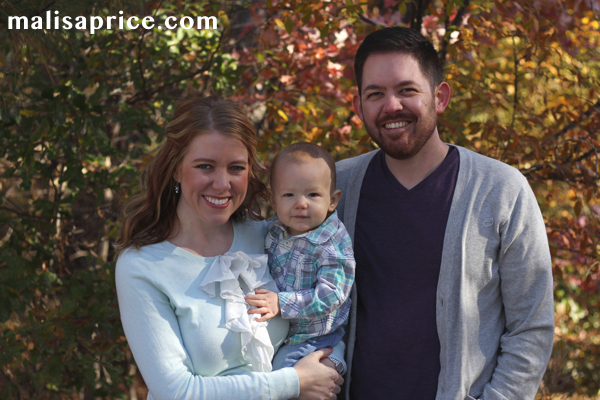 Thanks to Michael & Mikeah Sleigh for taking our family picture! Welcome to the first tour of our house in Raleigh, North Carolina! This is the first year we've needed to baby-proof our Christmas decorations. Luckily, my sister Heidi is one year ahead of me with parenting, so she gave us the idea of getting a tabletop Christmas tree. The best place to find these trees is The Home Depot. They are under $20 and include a stand that's already attached. Perfect for the impatient wife! Of course, I took Sammy with me to pick out our Christmas tree. He was very excited because he could reach it from his seat in the front of the cart. Last year, I didn't have time to give you a Christmas tour of our house. Maybe due to the fact we had a baby...? I did, however, blog about the Christmas stockings I knit for Anthony and myself. This year I made another one for Sammy and I surprised my parents with ones I made for them too! I still need to make another one for our new baby. P.S. We found out earlier this week we are having another boy due in May! Sadly, when we were moved here, I gave away my original Christmas pennant. This year I made a new one for our house and one for Heidi. My friend Jackie made me a Christmas wreath with yarn and felted flowers. 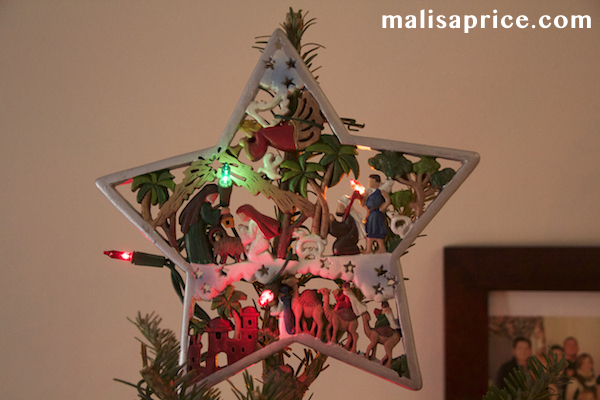 Here's a scaled down version of the nativity with the easiest vase-filled with ornaments (from the Dollar Tree) and my felt Christmas tree. I printed off a Christmas verse and glued it onto felt. Super simple and cost less than 10 cents! We have a Charlie Brown nativity set too. It's Anthony's favorite Christmas movie and the only movie we have watched nearly every Christmas morning together. The tablescape, complete with a wooden Advent calendar with removable boxes, that a friend and I painted. I can't wait to fill it with little candies and papers and fun activities to do as a family in future years! 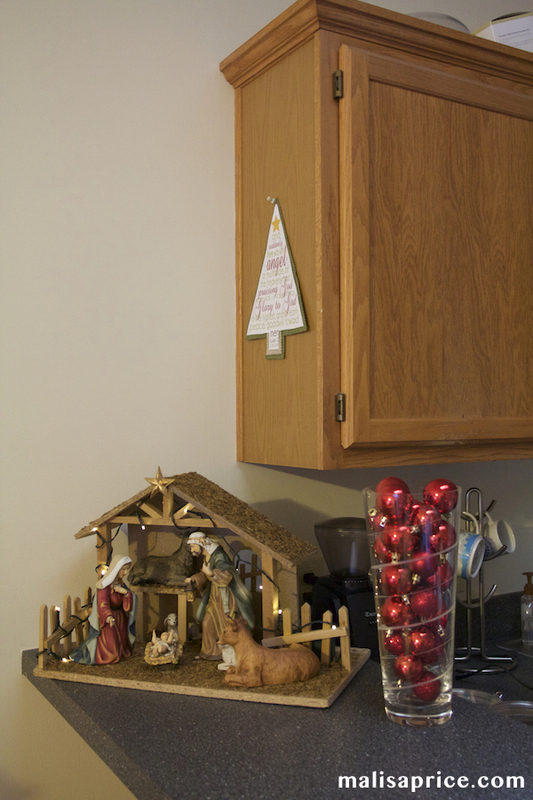 My grandparents gave us this wooden nativity 8 years ago and last year we used it for the first time as our treetopper. They passed away in October and December of last year and I love looking at it because it reminds me of them. Last year my mom and dad gave us these two ornaments, which are my current favorites as they include Sammy! That's it for this year's tour! I pray you have a very Merry Christmas and a great start to 2015. Linking up with The Nester for Christmas Tour of Homes 2014. For many months I have convinced myself that I don't have anything worth writing about. And what I write doesn't matter to you. I feel like just another voice amongst the millions of writers/bloggers out there. I have often thought my words are no different than the next person. 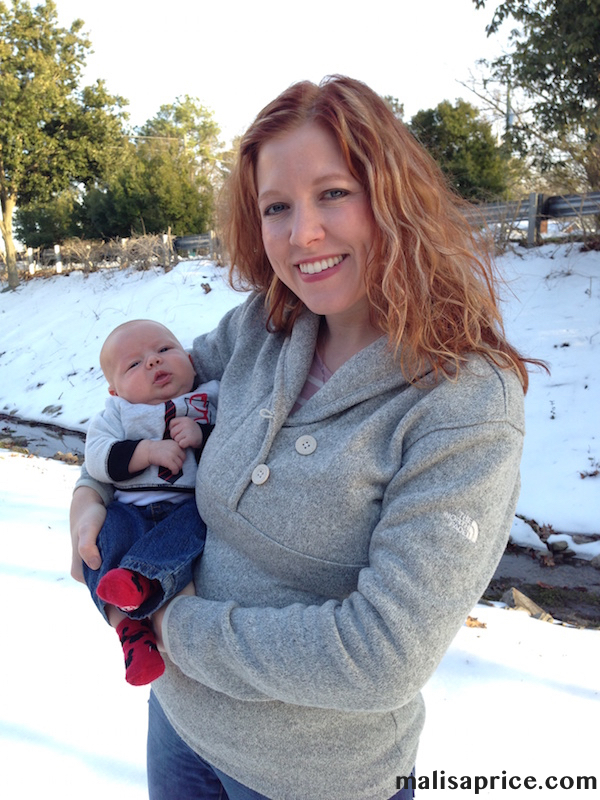 I don't want to become a "mom" blogger who gets on a soapbox and thinks I am an expert on child-rearing. But I think there might be a person out there who would be helped by reading what I have to say. Let's start with the thing I've been plagued with since December 23, when our first child Samuel was born. Being a mom is much harder than I ever thought. I have gotten on my own soapbox and written about how mom's should say positive things about being a parent. I'm not saying I don't enjoy being a mom. I am saying it is the most difficult thing I've ever done. Way harder than working full time and getting my Master's Degree. More challenging than being married. Light years tougher than moving across the country. One reason I believe the mom-life is strenuous: I'm a perfectionist. I do not want to fail my child. I do not want to make mistakes and I certainly don't want Sammy to go to counseling because of how we parented him. Another reason is: spiritual attack. We are endeavoring to raise our son to know and love God. We cannot control whether he will accept God, but we can raise him and be examples of loving and serving Jesus. The comfort this statement has given me has been unbelievable. Parenting and sleep training books are all helpful. Talking to other parents brings insight. But often for me, the only thing that works is prayer. Asking my Father for wisdom and what I should do for a particular nap, a certain food, what to do next. Prayer is the key. Or at least that's what I think with my 10 months and 8 days in to this (and heeding to the wisdom of my grandpa). Here in Raleigh, the Hubster and I have spent some time discovering cool places. One of our favorite spots is a local chocolate factory called, Videri Chocolate. From the minute you open the doors, your senses are excited. The smell of chocolate greets you like a warm hug. The samples are both savory and sweet. The self-guided tour appeals to your brain. We have been fortunate to have many, many visitors since having Sammy. And we try to always take them to Videri. When my parents were most recently here in April, we spent some time on Videri's patio talking, eating, and drinking chocolate. But it wasn't an ordinary chocolate. It was sipping chocolate. When my parents first tasted this treat, they immediately were reminded of their travels to Sao Paulo, Brazil (to see my cousins) where they also had sipping chocolate. Since I can't always get over to Videri, and I always want more than 2 ounces of the special drink, I figured out how to make a knock-off version. Although you can make your own version at home, I highly recommend getting over to Videri to try theirs! The best part about this sipping chocolate is that it can be made with Almond Milk. In fact, I have perfected the recipe using almond milk. So for anyone needing less dairy, here is your new best friend! Mix all ingredients together in a small saucepan. Heat over medium heat for 15 minutes, whisking often. Temperature should be causing the chocolate to be at a low boil. Chocolate is done when it coats the back of a spoon. Pour into cups and enjoy!